A.S.P. REFERENCE MEDUSA is Stage III Concepts’ ultimate statement in amplification/speaker interface technology, and once again, we offer the only speaker cables in the world using vacuum as dielectric. A vacuum is the ultimate electrical insulator, always superior to “inert” gases (vacuum tubes are never filled with Nitrogen or Helium for good reason). A multitude of unique technologies have been incorporated into this cable to virtually eliminate distortions of any kind, but special attention has been paid to mechanical damping of the highest level. The A.S.P. MEDUSA is the only available speaker cable using ferrite, ceramic and high density alloy granules to provide an almost perfect combination of shielding and mechanical, anti-resonance damping. The combined granulated materials make the cables extremely heavy, so equipment height and placement must be taken into consideration. A layer for H.D.A. (High Density Alloy) foil, as well as plated, braided copper add additional layers of EMI/RF protection offering an unprecedented level of sonic purity and an utterly black, empty silence. New conductor cross-section and geometry offer marked improvements in precision and realism over our previous speaker cable designs. Our unique palladium/silver alloy ribbon conductors deliver pinpoint accuracy with defined sonic layers in a natural, wide and palpable soundstage. The extreme gauge of the combined conductors maintains a very low resistance resulting the most impactful low frequency performance your equipment is capable of. The A.S.P. 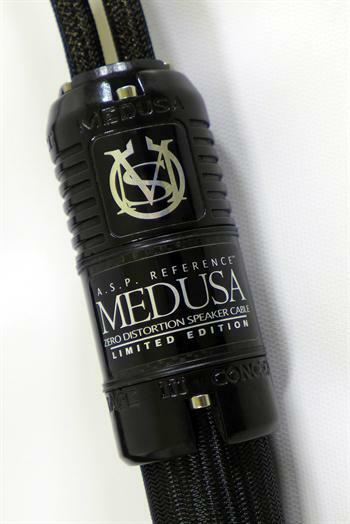 MEDUSA are without a doubt the most resolving, neutrally accurate speaker cables you can buy at any price. Designed to complement and even improve the most exacting and demanding audio equipment available. Experience them for yourself, you will be astonished. Stage III has hit another home run. It should be clear by now that the Medusa Speaker Cable from Stage III gets my top recommendation. A.S.P. REFERENCE MEDUSA speaker cables employ 8 expanded cross-section (7AWG total) cryo-treated, custom slow-extruded silver/palladium AeroStrandUltra™ ribbon conductors per channel. 2 x 4 conductors in a dual, quad-helix configuration. Vacuum dielectric; Nylon and FEP Teflon inner core drawn to 675mm.Hg. H.D.A. (High Density Alloy) 100% radiation invulnerable shield. Plus silver plated copper braid with 4 individually shielded conductor groups. Multi-layer construction with ferrite, ceramic and high density alloy granules for enhanced mechanical damping/shielding layer. Custom, hand made, proprietary nylon fiber filled polymer + woven carbon fiber housings. Exclusive variable-size, high-current solid silver spades as standard termination. Dual cryo-treatment.